The wire tensioning process requires accuracy in terms of pressure, speed, and repeatability. Damaged wires can lead to wastage of time and money. We at Armature Coil Equipment (ACE) understand these requirements very well. We provide our Model 46 device to meet exacting tension requirements. The ACE Model 46 Tension Device is designed to provide the necessary amount of tension without causing any physical damage to the wire insulation. This machine is capable of handling a variety of wire types, including flat, square, round, and rectangular wires. The device can provide tension for wires that are used in loop, group, or transformer winding operations. The machine consists of a heavy duty housing, which holds 13 square pressure plates. The housing also comprises four steel rollers, two in front and two at the rear. Attached to the top of the heavy duty housing is a T-Handle. When the T-Handle is turned, the rollers move to guide the wires through the device. This mechanism applies controlled pressure to the wire when it passes between the plates. The entire housing is set on a metal base. This can be mounted to ensure that the housing and the pressure plates are in a vertical position. This will allow flat wires to be wound at the edge as well as around the body. There is also an opening at the back of the housing. This makes it easy for the user to remove or replace pressure plates. 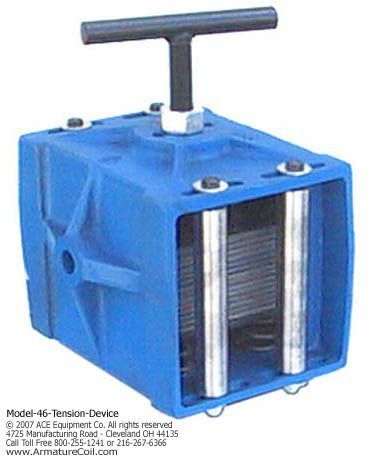 This model is a variation of the Model 46 tension device. The term T.I.T stands for Tension Indexing Traversing System. The main purpose behind this design is to reduce the amount of time it takes to insert a wire into the winding fixture slots. The device is also capable of layer winding parallel or stacked wires of the following types – single or multiple strands of round, square, or rectangular wires. This model consists of a tension device along with an indexing wire guide. The machine is mounted on a stand with linear slides, which are used for device control when manually operated. The slides enable the tension device to move in a linear direction. This helps the operator to produce field and layer wound coils of AC or DC motor coil quality at high speeds. If the machine has multiple winding slots, there is a button that can be used to move the indexing wire guide from one slot to another. On top of the machine is a T-handle, which is used to set the appropriate amount of tension required for one winding operation. During operation, the operator uses the T-handle to guide the wire along the T.I.T. The tension housing and linear slides together create a low friction coefficient. This allows the housing to track even the slightest linear movement. Model 46-T.I.T can be configured with other ACE machines to create a complete coil winding system. As previously mentioned, the operator can perform either field or layer coil winding processes. To ensure that the machine provides maximum benefits, ACE has designed the device to be customizable. Field Coil Winding: The device is supplied with an indexing plate consisting of holes in standard sizes of 1/4ʺ in diameter, and 1ʺ width between them. If the customer requires more stability, he can install additional indexing plates with drilled custom holes for the winding fixtures. Layer Coil Winding: The linear movement of the wire and the tension housing is interconnected. As the wire passes through the housing, its movement will result in the housing moving as well. The housing’s movement allows the operator to ensure that the wire is the correct position, and in line with the winding fixture. This also eliminates the possibility of wire crossovers. Both the Model 46 and the T.I.T devices enable the user to perform winding procedures quickly and efficiently. Users will find them to be safe, simple, and easy to use.